A display of elegance with dainty feet and delicate curves, the Amish Queen Anne Dining Room Table is a dining hall dream. 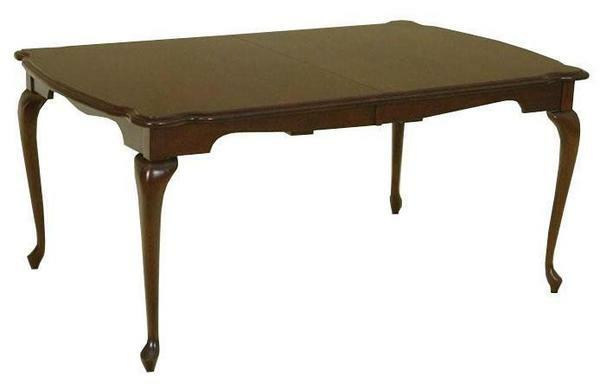 A stunning dining table that is ready for your family dinners and cherished celebrations. The iconic design features graceful curves throughout the top, along the skirt, and down through the legs - giving you the feeling of royalty every time you sit down for a meal with friends or family. Custom made with your choice of size, wood, and vibrant finish, you're sure to find the perfect combination to fit any dining suite. Built upon the principles of strength, durability and beauty, this elegant heirloom-quality table can be passed on to future generations. Call one of our Amish Furniture Specialists today at 1-866-272-6773 for assistance designing your table! Be sure to visit our blog for more information on dining tables and styles.